As GeoCurrents is deeply interested in the intersection of language, geography, and history, the two articles immediately grabbed our attention. Our initial response was one of profound skepticism, as it hardly seemed likely that a single mathematical study could “solve” one of the most carefully examined conundrums of the distant human past. Recent work in both linguistics and archeology, moreover, has tended against the Anatolian hypothesis, placing Indo-European origins in the steppe and parkland zone of what is now Ukraine, southwest Russia, and environs. The massive literature on the subject was exhaustively weighed as recently as 2007 by David W. Anthony in his magisterial study, The Horse, the Wheel, and Language: How Bronze-Age Riders from the Eurasian Steppes Shaped the Modern World . Could such a brief article as that of Bouckaert et al. really overturn Anthony’s profound syntheses so easily? The more we examined the articles in question, the more our reservations deepened. 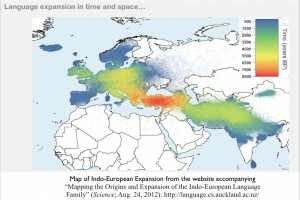 In the Science piece, the painstaking work of generations of historical linguists who have rigorously examined Indo-European origins and expansion is shrugged off as if it were of no account, even though the study itself rests entirely on the taken-for-granted work of linguists in establishing relations among languages based on words of common descent (cognates). In Wade’s New York Times article, contending accounts and lines of evidence are mentioned, but in a casual and slipshod manner. More problematic are the graphics offered by Bouckaert and company. The linguistic family trees generated by their model are clearly wrong, as we shall see in forthcoming posts. And on the website that accompanies the article, an animated map (“movie,” according to its creators) of Indo-European expansion is so error-riddled as to be amusing, and the conventional map on the same site is almost as bad. Mathematically intricate though it may be, the model employed by the authors nonetheless churns out demonstrably false information. Failing the most basic tests of verification, the Bouckaert article typifies the kind of undue reductionism that sometimes gives scientific excursions into human history and behavior a bad name, based on the belief that a few key concepts linked to clever techniques can allow one to side-step complexity, promising mathematically elegant short-cuts to knowledge. While purporting to offer a truly scientific* approach, Bouckaert et al. actually forward an example of scientism, or the inappropriate and overweening application of specific scientific techniques to problems that lie beyond their own purview. The Science article lays its stake to scientific standing in a straightforward but unconvincing manner. 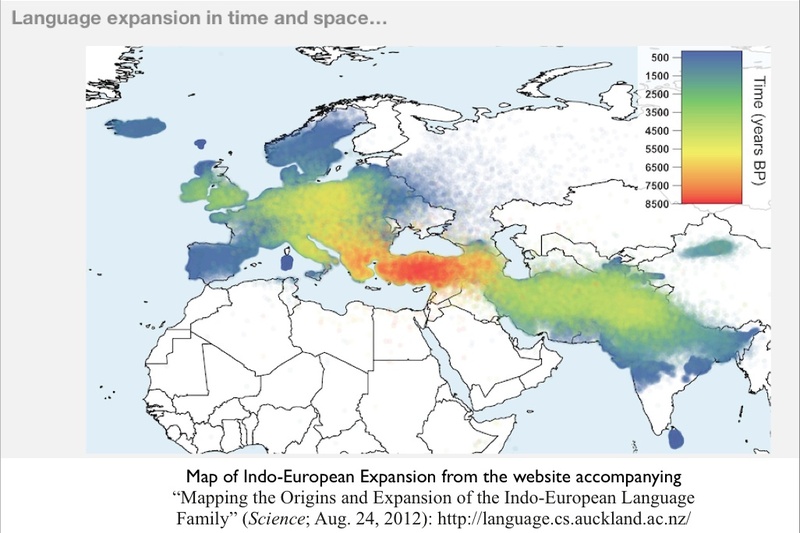 The authors claim that as two theories of Indo-European (I-E) origin vie for acceptance, a geo-mathematical analysis based on established linguistic and historical data can show which one is correct. Actually, many theories of I-E origin have been proposed over the years, most of which—including the Anatolian hypothesis—have been rejected by most specialists on empirical grounds. Establishing the firm numerical base necessary for an all-encompassing mathematical analysis of splitting and spreading languages is, moreover, all but impossible. The list of basic cognates found among Indo-European languages is not settled, nor is the actual enumeration of separate I-E languages, and the timing of the branching of the linguistic tree remains controversial as well. As a result of such uncertainties, errors can easily accumulate and compound, undermining the approach. The scientific failings of the Bouckaert et al. article, however, go much deeper than that of mere data uncertainty. The study rests on unexamined postulates about language spread, assuming that the process works through simple spatial diffusion in much the same way as a virus spreads from organism to organism. Such a hypothesis is intriguing, but must be regarded as a proposition rather than a given, as it does not rest on a foundation of evidence. The scientific method calls for all such assumptions to be put to the test. One can easily do so in this instance. One could, for example, mathematically model the hypothesized diffusion of Indo-European languages for historical periods in which we have firm linguistic-geographical information to see if the predicted patterns conform to those of the real world. If they do not, one could only conclude that the approach fails. Such failure could stem either from the fact that the data used are too incomplete and compromised to be of value (garbage in/garbage out), of from a more general collapse of the diffusional model. Either possibility would invalidate the Science article. Such a study, it turns out, has been conducted—and by none other than Bouckaert et al. in the Science article in question. Their model not only looks back 8,500 years into the past, when the locations and relations of languages families are only conjectured, but also comes up to the near present (1974), when such matters are well known. Here a single glance at their maps reveals the failure of their entire project, as they depict eastern Ukraine and almost all of Russia as never having been occupied by Indo-European speakers. Are we to believe that Russian and Ukrainian are not I-E languages? Or perhaps that Russians and Ukrainian speakers do not actually live in Russia and Ukraine? By the same token, are we to conclude that the Scythian languages of antiquity were not I-E? Or perhaps that the Scythians did not actually live in Scythia? And these are by no means the only instances of the study invalidating itself, as we shall soon demonstrate. An honest scientific report would have admitted as much, yet that of Bouckaert et al. instead trumpets its own success. How could that possibly be? As the critique we offer is harsh and encompassing, GeoCurrents will devote a number of posts to examining in detail the claims made and techniques employed by Bouckaert, Atkinson, and their colleagues. But before delving into the nitty-gritty, a few words are in order about what ultimately lies at stake. We are exercised about the Science article not merely because of our passion for the seemingly esoteric issue of Indo-European origins, but also because we fear for the future of historical linguistics—and history more generally. The Bouckaert study, coupled with the mass-media celebration of the misinformation that it presents, constitutes an assault on a field that has generated an extraordinary body of rigorously derived information about the human past. Such an attack occurs at an unfortunate moment, as historical linguistics is already in crisis. Linguistics departments have been cutting positions in historical inquiry for some time, creating an environment in which even the best young scholars in the field are often unable to obtain academic positions. The devaluation of historical linguistics is merely one aspect of a much larger shift away from the study of the past. Subdisciplines such as historical geography and historical sociology have been diminishing for decades, and even the discipline of history faces declining enrollments and reduced faculty slots. Academic history itself, moreover, has been progressively shying away from the deeper reaches of the human past to focus on modern if not recent historical processes. Such developments do not bode well for the maintenance of an educated public. At the risk of descending into hyperbole, we do worry about the emergence of something approaching institutionally produced societal dementia. The past matters, and we care deeply for the preservation of its study. *Make no mistake: we at GeoCurrents are strong supporters of the scientific method. Linguistics is itself a logically constituted, rigorous endeavor that counts as a science in the larger sense of the word, and I have myself co-edited a work defending science and reason against eco-radical and other far-left attacks (The Flight from Science and Reason, edited by Paul R. Gross, Norman Levitt, and Martin W. Lewis. 1997. New York Academy of Sciences).